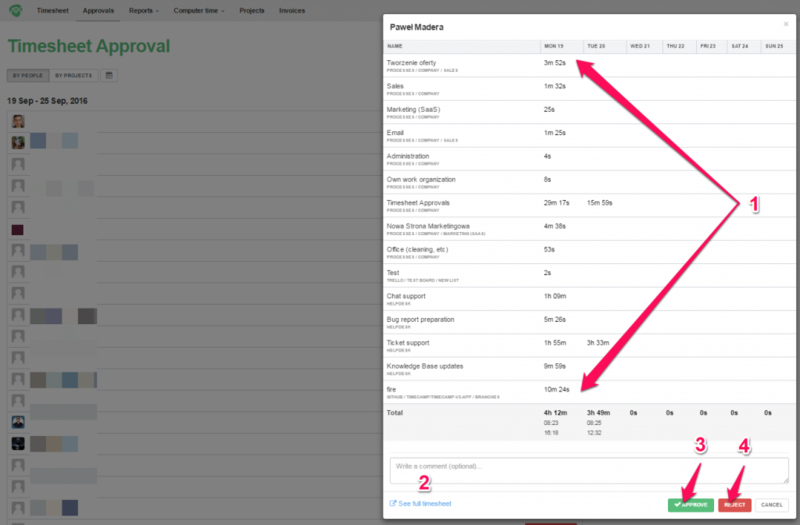 Note: approval status doesn’t affect Time Tracking Reports or Invoicing possibilities. 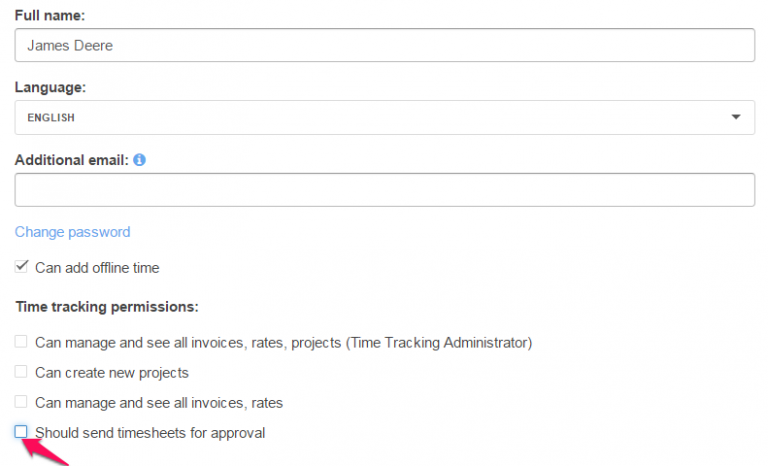 The Timesheet Approval feature allows project managers to approve time submitted by users on their timesheets. Administrators can choose between daily and weekly mode of approving timesheets. Once approved, the timesheet will become uneditable for users (they won’t be able to either add new time to approved day or edit time entries). Administrators can unlock approved timesheets at any time. After activating this module timesheets can be submitted from Textual Timesheet or Graphical Timesheet. By default, everyone is required to submit timesheets for approvals. To create exceptions, go to Settings (1) -> Users (2). Select desired user (3). On the next screen, in “Time tracking permissions” section, disable the “Should send timesheets for approval” checkbox and save user’s settings at the bottom of the page. On Graphical Timesheet, to submit your timesheet for the specific day, you’ll need to activate this day first (click on the column representing this day on your timesheet). Submission link appears on top of the column, next to the date. After submitting the timesheet, administrators and Project Manager receive an automatic email notification from our system. This notification can be turned off in My Profile settings page. 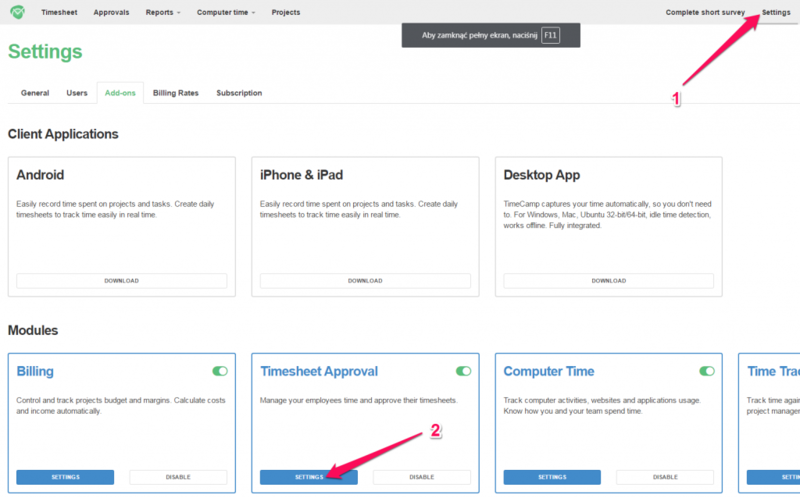 Once timesheet is submitted, users can reopen it at any time by themselves (providing it hasn’t been approved yet). Timesheets can be approved by Time Tracking Administrator or Project Managers assigned to specific projects. 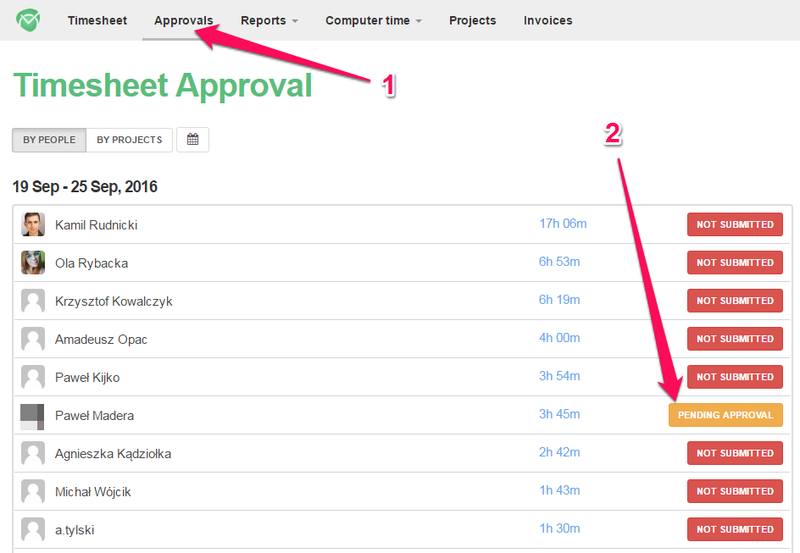 To see timesheets pending for approval select the Approvals option from the left menu (1). Here you can find the list of timesheets from your company. Only submitted timesheets can be approved. To see details about submitted timesheet. Click, on the orange “Pending Approval” button (2). Here you’ll be able to analyze time entries from submitted timesheet (1). You can write an optional note to your user (2), which will be displayed in the confirmation email (s)he’ll receive after you either Approve (3) or Reject (4) timesheet. Rejecting the timesheet automatically reopens it to the user, so he can edit it. 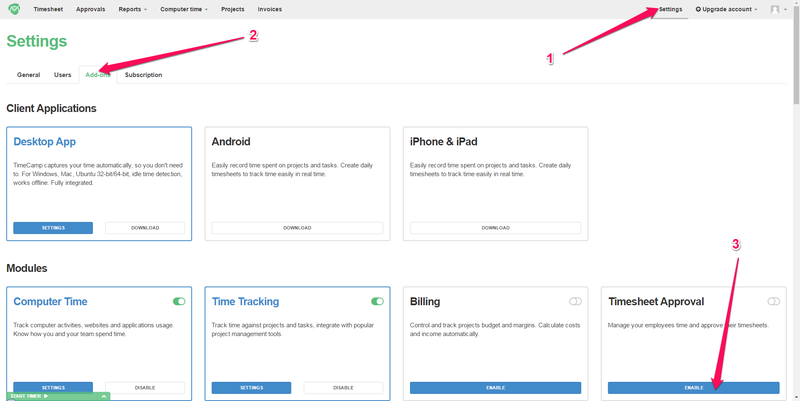 Clicking on time assigned to specific time entry will redirect you to user’s timesheet for further analysis. Confirmation/rejection email is always sent to user automatically. They can opt out of those email on My Profile settings page. 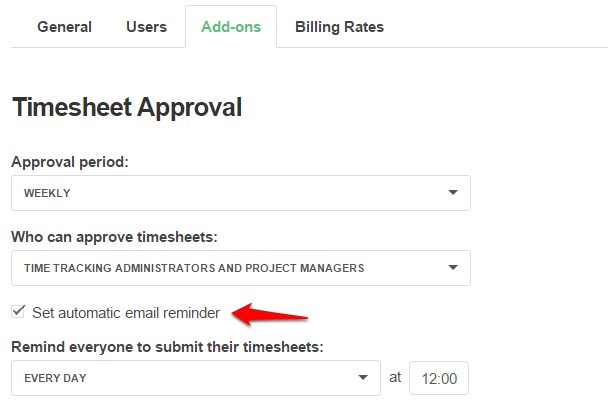 You can set up an automatic email reminder which would be sent to all users to remind them about timesheets submission. To create this kind of reminder go to Settings (1) and find “Timesheet Approval” on “Enabled add-ons” list. You’ll find Settings for this feature at the bottom of next page.